The Dreamcast had woeful Light Gun support, and as far as I can tell, only 2 games were released in PAL regions with full gun support. So, of a small pool, which is the best light gun game on the Dreamcast. House of the Dead 2 or Confidential Mission. Don’t expect Shakespeare here, what you get is a simplified retelling of two James Bond films, GoldenEye crossed with The World is Not Enough. You have a terrorist organisation stealing a weaponised satellite, and a final duel versus a submarine. Along the way you visit a museum, a train journey where you rescue a lady who programmed the satellite. And finally, you take it to the enemy base, with dock and sub. 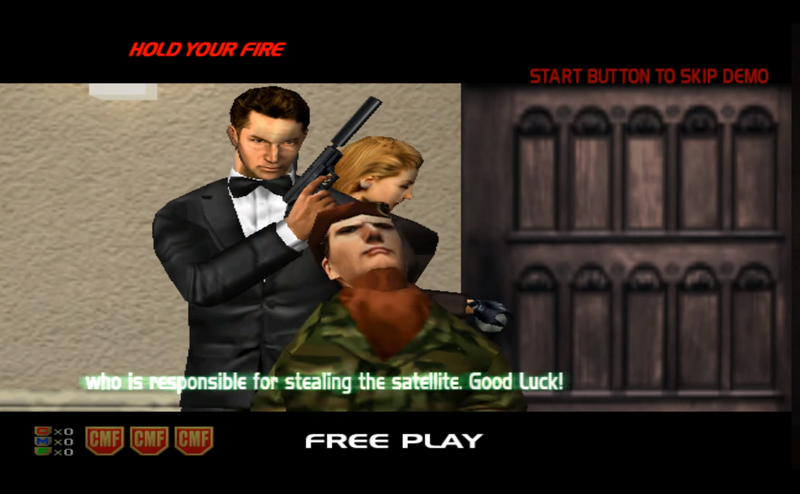 So, to reiterate, this is the plot to GoldenEye and The World is not Enough combined. Confidential Mission is a light gun game, so you point your gun at a CRT screen and make pew pew noises. Like House of the Dead 2, you get branching paths. However, in Confidential Mission the branching paths are clear. On each level there are 2 branches, each one is introduced in a cutscene, and then you’re given a short minigame. Pass the minigame and you’ll go one way. Fail, you’ll go another. It is a nice touch, and you’re not punished with the loss of a life for failing. The bosses are all fairly fun, and never feel unfair. There is always enough time to hit all the targets, and if you fail, it was your reactions that let you down. Not predestined programming to eat your arcade money. 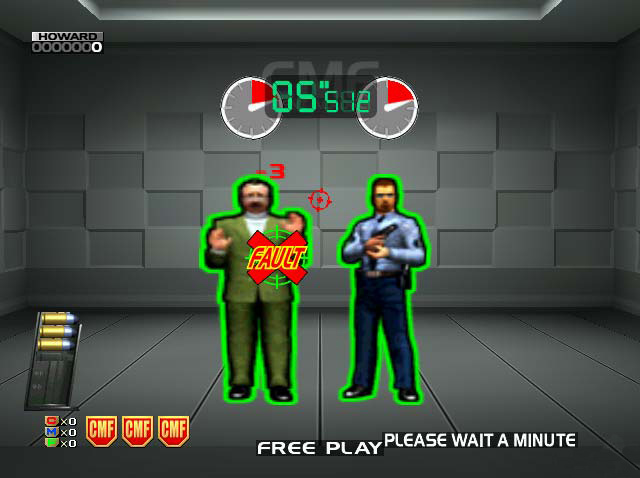 Most light gun games have a tedious training mode, and then some sort of generic “original mode”, in Confidential Mission, the training levels are fun Point Blank-like minigames. They can be difficult, but with a bit of practice they are beatable. Once you beat the initial training missions you unlock Another World mission. While I was disappointed that this was just normal arcade mode (on the surface), it is actually a much more enjoyable version of the game. It is much harder, and all the skills you’re taught in the training mode are applied to the main game. It adds more enemies, makes better use of the aim reticle around enemies (allowing you to prioritise targets better), and adds more hostages. All round it is a decent addition to the game, but I do feel it lacks another mode. I played through arcade mode twice, beat the initial training missions, then beat another world within two hours. So if you’re reasonably good at light gun games you’ll breeze through it, since a single run will take you around 30 minutes. Having said that, it is fun. 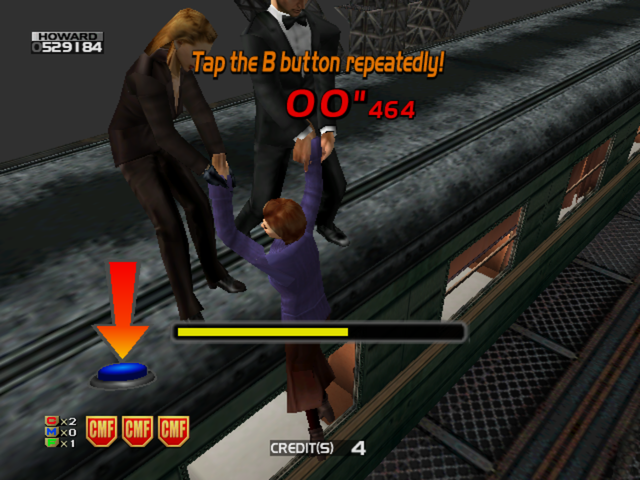 The daft faux-Bond characters/story are fun, and while the story and acting is woeful it feels a little more intentional than it did in House of the Dead 2. 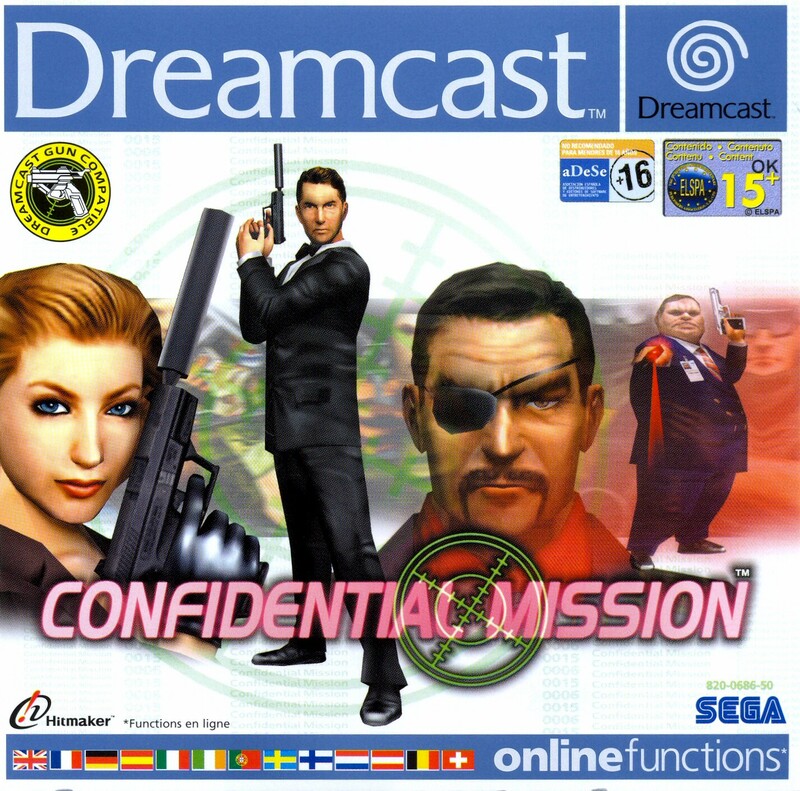 I personally prefer Confidential Mission (just) over House of the Dead 2, so, of these two games Confidential Mission wins the Dreamcast Light Gun crown. I never saw this in the arcades, and neither has anyone on Reddit. But Dexter the TV show featured it briefly! Maybe I should dust off the ol’ dreamcast!